I’m really lazy when it comes to using services on the internet properly. Until a few months ago, I used Pocket for storing articles I needed to read later and also random bookmarks I wanted to save. Thanks to that my Pocket list was a mess and I eventually spent some time cleaning it up and tagging things properly. Pocket is great for saving articles to read, videos to watch and media in general but it isn’t good for bookmarking. It isn’t meant for that. Preshit has mentioned Pinboard to me and the service seemed perfect for what I wanted in a companion to Pocket but procrastination got the better of me. When I finally saw the teaser site for Pushpin 2.0 by Lionheart and Viticci’s review back in June, I was pretty blown away. I finally signed up for Pinboard thanks to Pushpin 2.0 and haven’t looked back since. This app screams polish and care right from the get go. I don’t throw around clichés for nothing. More and more apps that require logging in have started adding 1Password 4 support. Pushpin can launch 1Password 4 into a search for Pinboard so you can easily copy and paste your details here. Funnily enough this is the only screen that doesn’t look good in comparison to the rest of the app. The browse page looks absolutely stunning with lovely icons for each personal bookmark category and the gradient used behind the numbers used. Pushpin also lets you browse network, popular public bookmarks, wikipedia bookmarks and Fandom and Japanese feeds. The organization in the app is great. You have quick access to your notes and tags on the top right. Tapping a bookmark will open it in the in app browser and you can tap the fullscreen button on the top left if you enjoy browsing in fullscreen. The in app browser also has full mobilizer support. There are 2 share buttons here. One allows you to share to social networks or email the bookmark and the other lets you send the URL to pocket, use an external browser or copy the URL. The share sheet that slides up is one of the best I’ve seen. The use of very subtle gradients and similar colours throughout the UI in the app is really amazing. You can also add a bookmark from within the in app browser and Safari or Chrome on your device using the bookmarklet available on the URL Schemes page. Pushpin has full URL scheme support. Interacting with bookmarks within the app is super fast. 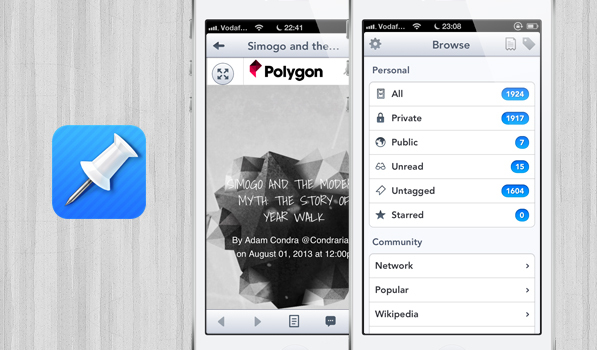 Tap and hold for quick actions like Sending it to Pocket, copying the URL, marking as read and editing the bookmark. The edit screen lets you manipulate everything from the title to the privacy settings. The inline autocomplete implementation for tags in Pushpin is something more apps should implement. Pushpin has an abundance of settings for how bookmarks are saved within the app and a few gesture settings. My favourite one is double tap to edit a bookmark. Pushpin has secured a permanent spot on my homescreen on iPad and iPhone. The speed of the app is as good as the looks of it and while I absolutely love the iPhone app, the iPad app interface right now is just a blown up phone UI. It isn’t bad in portrait but looks quite bad in landscape mode. The small details like the super animation while authorizing with Pocket make the app memorable in every way. My experience with Pinboard keeps getting better with Pushpin and apps that let me quickly save a link to Pinboard. Pinboard is a paid service and as of now you can sign up for a one time fee of $10.17 here. Apps like Pushpin for iOS and ReadKit on the Mac make it beyond worth it. Don’t expect any customer support for Pinboard though, because interacting with the developer makes you almost want to delete your account. Pushpin for iOS is available as a universal app on the App Store for $9.99. Calca – Simple. Elegant. Powerful.